The password must contain at least 8 characters, including at least one capital letter and one digit. Precision is our top priority at all stages in the production of FILTRON filters. The evidence lies in the use of modern and automated manufacturing lines, advanced methods of laboratory quality control and innovative design solutions. 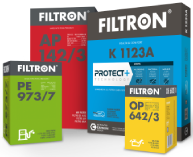 FILTRON filters have gained the trust of hundreds of thousands of European mechanics thanks to their precision.